One of the most popular private detectives ever, red-haired Miami P.I. MICHAEL SHAYNE has had a long, successful, multi-media career. Shayne was created and first appeared in the 1939 novel, Dividend on Death, by Davis Dresser, published under the pseudonym Brett Halliday. Dresser wrote fifty Shayne novels (with a little help from ghostwriters such as Ryerson Johnson) and twenty-seven more were written by Robert Terrall and published as paperback originals by Dell, still under the pseudonym Brett Halliday. So that's 77 novels, over 300 short stories, a dozen films, radio and television shows and even a few comic book appearances. 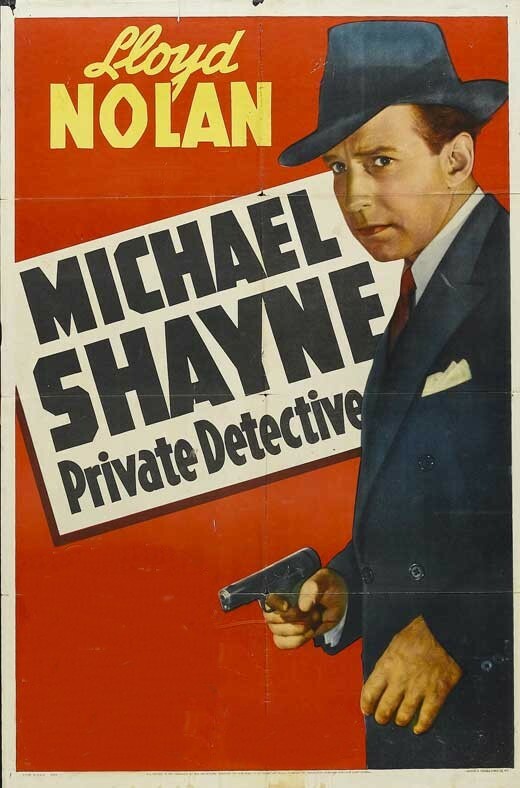 The 1940 film Michael Shayne - Private Detective was the first in a series of 7 films starring Lloyd Nolan as Shayne. The series was dropped by Twentieth Century Fox in 1942 and later picked up by PRC in 1945. These films were well done and Nolan played the character well in his easy gong manner.. Some films were based on novels while others were based on different stories. All containing the characters created by Brett Halliday in his novels.